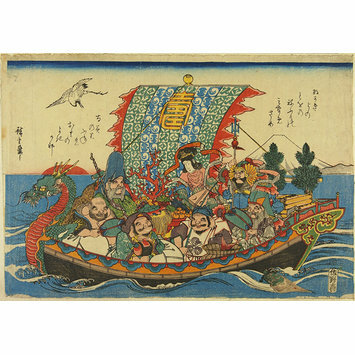 The Seven Gods of Good Fortune (Shichifukujin) are depicted here as humorous deities gathered together in their Treasure Ship (Takarabune). A picture of the Treasure Ship along with the Seven Gods became an essential part of the New Year celebrations. It was placed under the pillow in order to promote lucky dreams, for legend has it that the original ship sailed at this time of year bearing its treasures. The sail of the ship depicted here carries the character Ju, meaning longevity, and the print features other symbols of longevity, such as the crane, the long-tailed turtle and branches of pine. 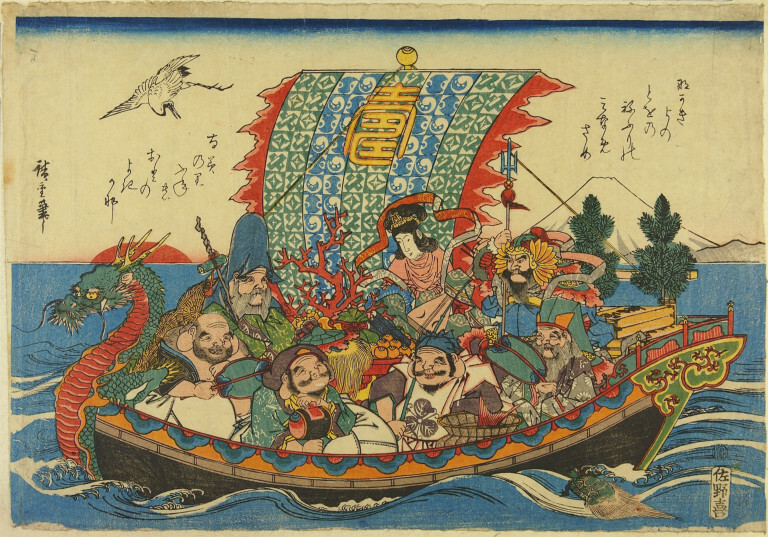 The Seven Gods of Good Fortune are depicted here as humorous deities gathered together in their Treasure Ship (Takarabune). A picture of the Treasure Ship along with the Seven Gods became an essential part of the New Year celebrations. Legend has it that the ship sailed at this time bearing its treasures. The sail of the ship bears the character Ju, meaning longevity, and the print features other symbols of longevity such as the crane, the long-tailed turtle (minogame) and pine branches.